(If you have questions about the program, email me at robin@funeralfuturist.com)I would like to invite you to register for my online training program: The Funeral Marketing Blueprint Course. Do you want your potential client families to know why your funeral home provides more value and better service than your competitors? Would you like to have a marketing plan that incorporates all marketing channels including print, direct mail, websites, search engine optimization, social media, email marketing, mobile marketing, and online reputation management into an easy-to-implement marketing plan? Do you want to know how to educate your potential client families to choose your firm instead of your competitor? Do you want your Funeral Home to be “Top Of Mind” at the very moment that a client family chooses a funeral home? Would you like to know how to easily track your effectiveness of your advertising and eliminate the “guessing of what half of your advertising” works? If you answered YES to any or all of these questions, I want you to register for my online, Funeral Marketing Blueprint Course. This 8 module program will walk you through the process of creating your own Funeral Marketing Plan and also provide you with proven ways to increase the effectiveness of your advertising. 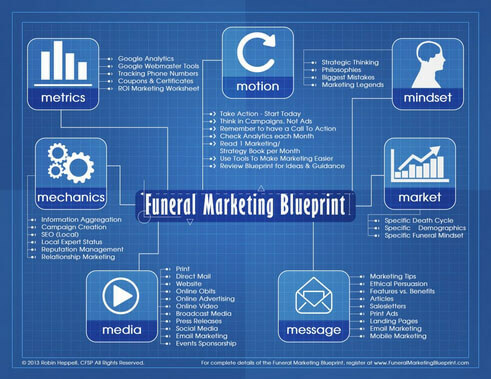 The Funeral Marketing Blueprint is a complete marketing plan for Funeral Homes that includes both offline and online channels including Print, Radio, Websites, SEO, Pay Per Click, Online Obits, Videos, Social Media, Online Reviews and Reputation Management. I want to remove any risk on your part by offering you my 100%, no-questions asked, still-friends, money-back Guarantee! If, after taking the program, you can’t take some of the strategies or ideas and implement immediately, or if you’re not satisfied for any reason, I’ll refund your entire registration fee.